Many of you who read this blog know how passionate I am about the Canadian Cancer Society. As I witness more family and friends have their own experience with cancer, it just heightens my resolve to do what I can for this cause. This month, the Canadian Cancer Society launched its "Sugar-Free September" campaign. I had a quick read about the campaign, and decided to sign up. Now, let me begin by saying, I am a true sugar addict. I would eat and drink copious amounts of sugar every day. It was even bad enough that I would hide some of my sugary treats from my family. I knew this wasn't good for me, but I did it anyway. Sugar-Free September has some basic rules - no items with added sugar, fruits and veggies are permitted. 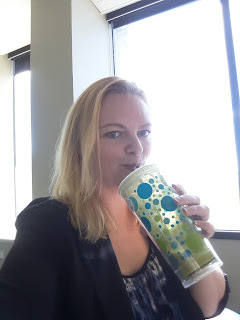 Me and my favourite sugar-free smoothie! Now, don't get me wrong, I won't say I'm "completely" sugar free. I'm still eating pasta and bread, but in reduced amounts. Why Do You Love Disney? I get asked this question regularly. 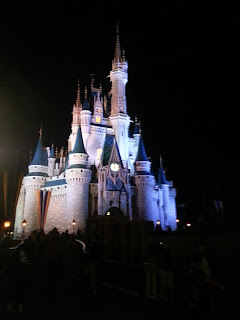 I didn't take my first trip to Disney until I was 31 years old. I used to think I wouldn't enjoy it - children's characters everywhere, so many people, etc. I had visions of our local yearly carnival, but on a bigger scale. We have traveled to Disney for each of the last 4 years. I put a lot of work in to saving and bargain hunting. Some people may think that sounds like a nightmare, but I actually love travel bargain shopping. From the first time I stepped in to a Disney Park, I knew I loved it. Cheesy, right? But it's true. Why do I love Disney? I love the excitement leading up to the trip. I love seeing all of my favourite childhood characters. I love seeing the look on my daughter's face when she meets the princesses. If I can be cheesy again for a moment, I would describe it as a truly magical experience.